(RRP £259.99). 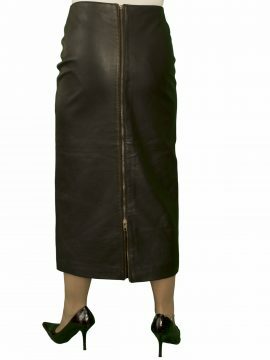 A beautiful leather pencil midi skirt for smart wear, made in fine quality smooth and soft lambskin nappa. It reaches below the knee (26in length) and features a 12in vent at the back. It sits on the waist and is a close-fitting style to emphasise your shape. Made by Ashwood. An exquisitely tailored, elegant black leather pencil midi skirt in beautifully soft, smooth nappa leather that is ideal for smart or smart-casual wear, day or evening. It reaches below the knee for a shapely close fit. A split/vent at the back gives added style as well as making it easier to move around.